Charles Seim is a bridge engineer who worked on dozens of bridges over the course of his career. But one of his early works was a contemplation of forces in a rather different structure: the strapless evening gown. Consider now an elemental strip of cloth isolated as a free body in the area of plane B of figure 1. 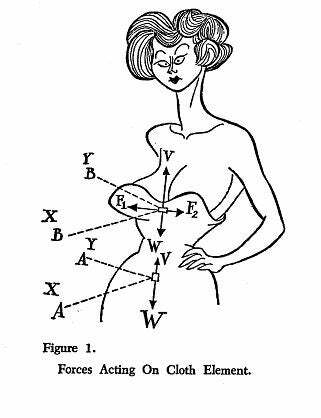 The two tangible forces F1 and F2 are equal and opposite as before, but the force W(weight of dress) is not balanced by an upward force V because there is no cloth above plane B to supply this force. Thus, the algebraic summation of horizontal forces is zero, but the sum of the vertical forces is not zero. Therefore, this elemental strip is not in equilibrium; but it is imperative, for social reason, that this elemental strip be in equilibrium. If the female is naturally blessed with sufficient pectoral development, she can supply this very vital force and maintain the elemental strip at equilibrium. If she is not, the engineer has to supply this force by artificial methods. You can read his full analysis at Neatorama. It would be interesting to see Seim's analysis applied to various wardrobe malfunctions, but it would be even better if his engineering experience could eliminate the need for the constant tugging and readjusting of a strapless dress throughout the evening.